My goal: My priorities have changed as I've aged. What's most important is to get married, have children and focus on family and my walk with Christ. I Am: I've realized that a GF isn't just a "soulmate" for myself. I'm looking for someone that will be my wife, the mother of my children and the new daughter of my parents. Her and I will start our own family yet we will be apart of each other's families as well. I will love her parents as I love my own. Being around so many people who have divorced and although I have not been tested, this is my belief going into a marriage... I have a Film background and have been a romantic most of my young adult life. Understanding and feeling empathy for the human condition has been a key part of writing stories and making good dramatic films. My grandparents were married for over 60 years when my grandmother died. I realized I understood so little about Love when I saw the pain in my grandfather's face. I've been heartbroken and hurt from relationships like most of us but it was humbling to see how little I knew compared to what my grandfather had with his wife. I am looking for the relationship with someone that my grandfather lost a few years ago. I hope we can share more about our ideas of love, relationship, marriage, family and faith when we are together. Yes, I am a light smoker and an even lighter drinker. I usually never have more than 1 drink during an outing or occasion. I don't expect to be a smoker when I have a family. 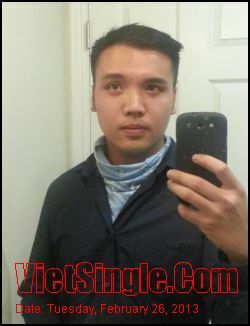 I am also an Evangelical Christian but VietSingle didn't have that as a choice to select. Looking For: I'm looking for someone who no longer views their parents as a nuisance but have learned to see the wisdom of their experience and advice. I'm looking for someone who has thought deeply concerning what marriage means and their personal roles in it. I'm looking for a person to potentially be my wife, the mother of my children, the step daughter of my parents, the step sister to my siblings. And I am looking forward to becoming a part of her family and begin our own as well.